Separate thecal sac from the epithelium: It is best to know the level of function prior to surgery. 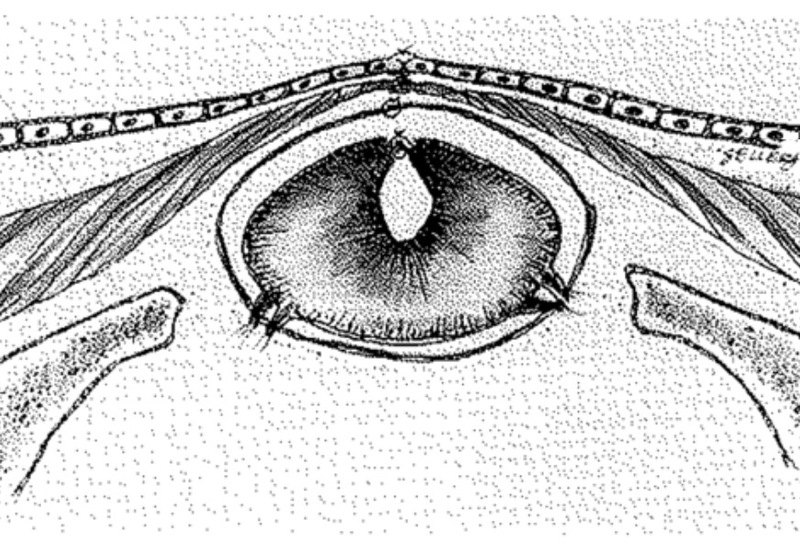 First, mark the midline above and below the sac. Then, define the plane between the thecal sac and the dysplastic epithelium and cut the epithelium at its point of juncture with the thecal sac. Free placode: In general, the placode must be freed from the surrounding skin circumferentially by sharp dissection. 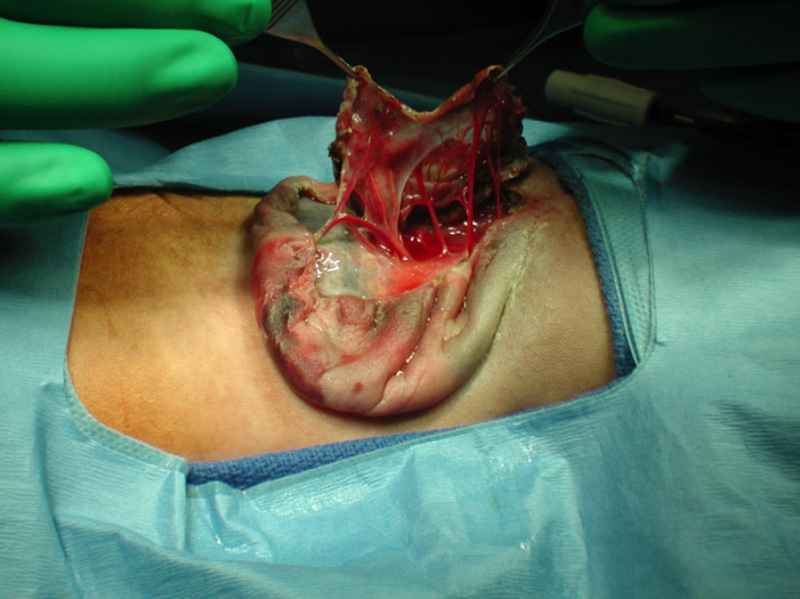 Any retained skin may cause a dermoid/epidermoid in the future. 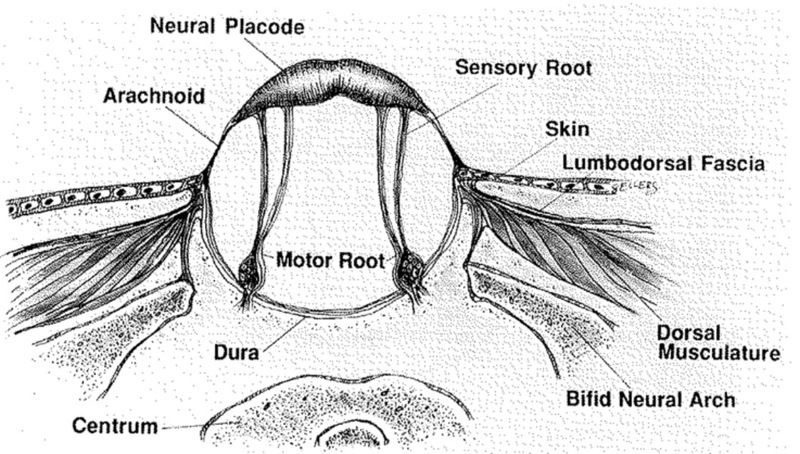 Ensure cord is untethered: Once the placode and nerve roots are free from the dura and epithelium, care is taken to ensure the cord, especially at its rostral end, is completely untethered. The filum terminale, if present, is transected. 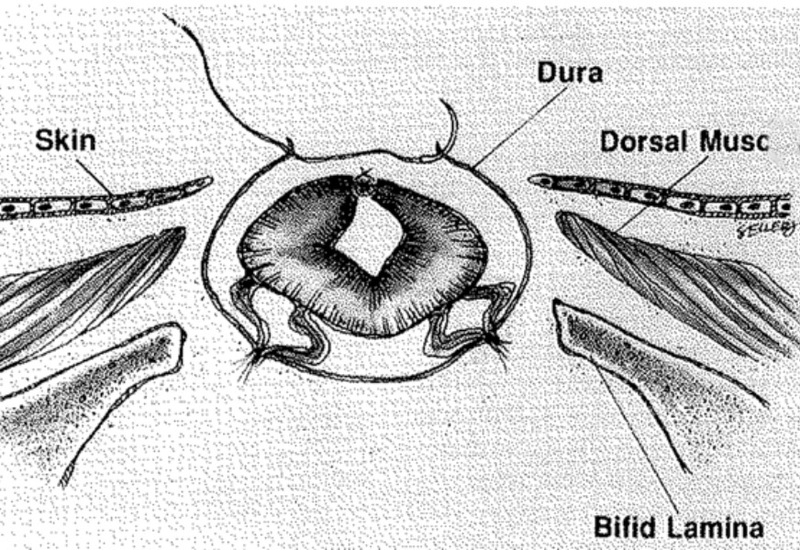 Neurulation: The placode should be rolled in upon itself and closed by suturing the pia from either side together to minimize the risk of re-tethering. 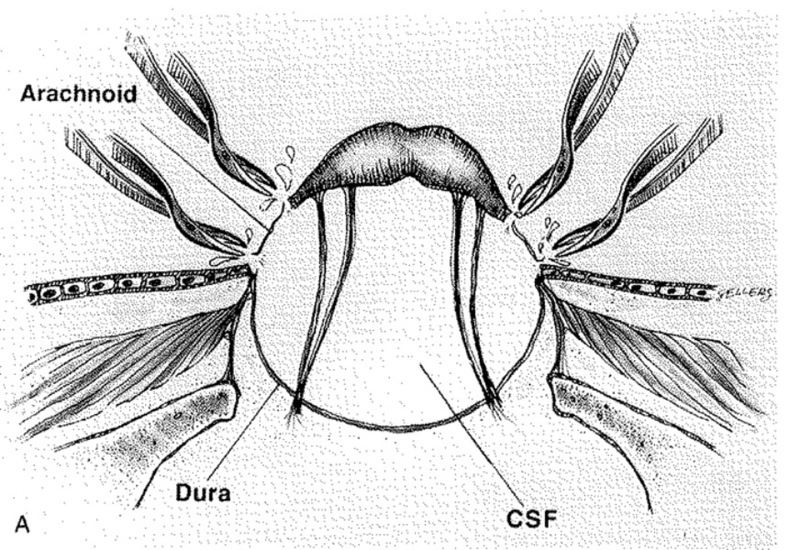 Close dura: The dura is then mobilized at its lateral and anterior aspects until epidural fat is seen; the caudal aspect of the dissection is performed last. Close muscle and fascia: Some surgeons move muscle or fascia over the dural incision line. Close skin: A watertight skin closure is done. Concomitant treatment is provided for hydrocephalus, if it was present at birth. Treat hydrocephalus:The first line of treatment is to treat hydrocephalus, as this is usually the cause of brainstem signs (1, 59). A smaller number of children will actually need posterior fossa decompression. The older literature reports a 15% mortality rate and a 30% rate of permanent neurological disability in infants who require posterior fossa decompression (32). Surgeons’ anecdotal (unpublished) data seem to suggest that these rates have diminished dramatically since paying more attention to the CSF shunts, regardless of ventricular size. ETV: ETV +/- choroid plexus coagulation is not standard, but there are promising data that this procedure can help avoid shunting in some children (1, 30, 31).